If you browse around here at Adventures of Cecelia Bedelia, it’ll soon become apparent that I love food almost as much as I love books. And in news that should surprise exactly no one, the recipe posts I occasionally put up are the most popular ones on my blog. After all, food is one of the necessities of human existence. I also consider books necessary, but I know I’m in the minority in thinking that. Combine books and food, and we’re in business. 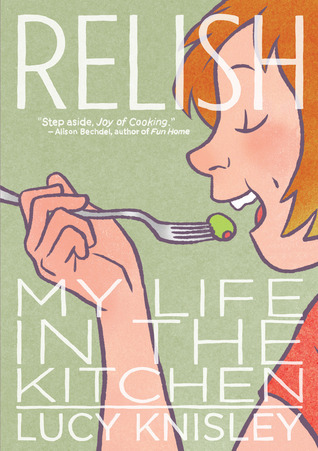 Lucy Knisley’s graphic novel memoir Relish does just that, with charm. A vibrant, food-themed memoir from beloved indie cartoonist Lucy Knisley. A welcome read for anyone who ever felt more passion for a sandwich than is strictly speaking proper, Relish is a book for our time: it invites the reader to celebrate food as a connection to our bodies and a connection to the earth, rather than an enemy, a compulsion, or a consumer product. Lucy grew up as the daughter of foodies, and as such developed a taste for all things different and gourmet (and sometimes expensive!) at a young age. Because she associates certain memories with food, it naturally made sense for her to write a food-based memoir, complete with recipes at the end of each chapter. And as a talented illustrator, she can also share her memories in images. Lucy’s upbringing in the kitchen and wonderful talent are on display in Relish, and her experiences from childhood through early adulthood come to life through her writing and art. Of course Lucy doesn’t transcribe her experiences in a completely linear fashion. She approaches each set of images as a separate piece of the puzzle, and though it may not be immediately apparent, she plays with perspective until each panel fits in the whole. There’s no extraneous, self-indulgent filler – the medium won’t allow for it. This, combined with subjects she clearly loves (food, family, travel, art), makes for a thoughtful, lively story that will appeal to graphic novel pros and newbies alike. I’m also convinced that Lucy and I would be friends. It could happen! (in my dreams…) While each chapter/vignette in Relish has its own charm, my favorite part of Lucy’s story was her obvious love and respect for her mother, which is visible on almost every page. I too credit a lot of my own quirks and character to a loving family and food. In all, Relish is a delightful change of pace, and it made me happy and proud to be a budding foodie. I can’t wait to try Lucy’s Spice Tea (chai) recipe! Recommended for: anyone who enjoys graphic novels (or is hoping to start reading them), foodies, and those who enjoy YA memoirs. Probably most appropriate for readers ages ten and up. Fine print: I received an electronic advanced copy for review from First Second (Macmillan) via NetGalley. And then I got the book from my local library because I didn’t finish it in time. Wow! This must be the week for RELISH! Everyone's reviewing it. Thanks for joining the enthusiastic readers who've heartily recommended it :). Sounds soo cute and I love that you want to be friends. I love when I read a book and that happens. Interesting that three of the Weekend Cooking posts this weekend are about Relish! And, though I didn't post yet about it, I read it this week, too! This one is on my want list! I've heard so many good things, and I love food myself. I think graphic novels are a great medium for foodie memoirs/stories. What a fun book! I love love love Relish. And I would very much like to be friends with Lucy, too. I've heard lots of great things about RELISH. Must add it!! Oh yes! I'd love to be friends with Lucy (see, we're already on a first-name basis). I loved French Milk and can't wait to read this one!! I also want to be friends with Lucy! ;) And YES...I too have my eyes on that chai recipe. I've always wanted to make chai from scratch!